Ryan and Company Realtors, Inc.
Wauconda, Illinois is a community of about 14,000 residents in westernmost Lake County, northwest of Chicago. The Village of Wauconda surrounds beautiful Bangs Lake, a 306 acre recreational jewel that offers a variety of recreational activities such as swimming, fishing, and boating. Historic buildings and tree-lined streets offer an escape from the bustle of everyday life. Wauconda Homes for sale include historic bungalows in town as well as waterfront homes along the shores of Bangs Lake. Wauconda real estate offerings also include some condominiums as well. A potential Wauconda home buyer will enjoy reviewing the many types of properties to be found here. Real estate in Wauconda includes modest starter homes as well as more luxurious homes on acreage. Wauconda IL real estate will also include developed lots in newer subdivisions for those that want to build their own custom homes. Settlers of European ancestry did not arrive here until the 1840s, only after the native Indians had moved westward. Traditon suggests that the community was named after an Indian Chief "Wakanda." The word means "Spirit Water." In 1848, Justus Bangs built a cabin near where the town hall is located. Bangs Lake is named after him. Early settlers came here primarily from New York and New England. Some took advantage of the relatively new Erie Canal to migrate westward. Another member of the Bangs clan, Ambrose, drove the stage coach on its route from Chicago to Janesville, Wisconsin for eight years. 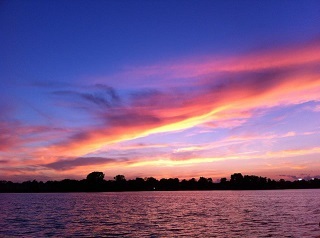 The Village of Wauconda fully encompasses the 306-acre Bangs Lake. This recreational jewel offers swimming, fishing, and boating to area residents. The average depth of this glacial lake is over 10-feet; its maximum depth is 32-feet. The nearby Chain O' Lakes State Park is centrally located amidst the largest concentration of lakes in the entire state of Illinois. It borders three lakes: Marie, Nippersink, and Grass. The Fox River is also a prominent feature. The large 6,000-acre facility includes two campgrounds and seven picnic areas. Horse rentals and horse-drawn wagon rides are offered seasonally. The park's many trails include those for hiking, biking, and horseback riding. This year-round park also offers ice skating, cross-country skiing, and ice fishing in the winter. The Lake County Discovery Museum is a great Wauconda destination for those wanting to get more closely acquainted with the history of the area. The museum includes artifacts and hands-on exhibits. Various educational programs are also hosted by the facility throughout the year. Directly east of Wauconda, and also in Lake County, is Six Flags/Great America. Six Flags features some of the fastest and most dynamic roller coasters in the whole country. A new wooden roller coaster, the "Goliath," can accelerate riders to speeds in excess of 70 miles per hour. Take on the largest corn maze in the world in nearby Spring Grove every October. The "Maze Til Midnight" event is best experienced with flashlights and/or glow-sticks. The 33-acre corn maze is open until midnight for this much-anticipated annual event. Wauconda is also full of many organizations for the whole family. Some of the very popular organizations include, Bulldog Youth Sports, Wauconda Area Youth Soccer, Lake Youth Athletic Association (Baseball, Football, Girls Softball), a very interesting Historical Society, Wauconda Township Senior Services, Wauconda American Legion Post 911, and so much more! For more information on homes for sale in Wauconda IL, please fill out the form below. This is a one-stop real estate website for all your home buying and selling needs in Wauconda, IL.